The Silo Art Factory of Mycenae overwhelms those who visit it. This rule has not escaped the popular show “insist that Greece” BRING NERIT, which raised the space and projects, while broadcast messages of Stelios d. Marangou to the environment across the country. The fame of the Art Factory and Silo of Stelios d. Marangou spread and this unique multiplex begins to established on visitor choices of Argolis. The Panhellenic view is not only important for the Silo Art Factory, but also for our region, once advertised capabilities across Greece! 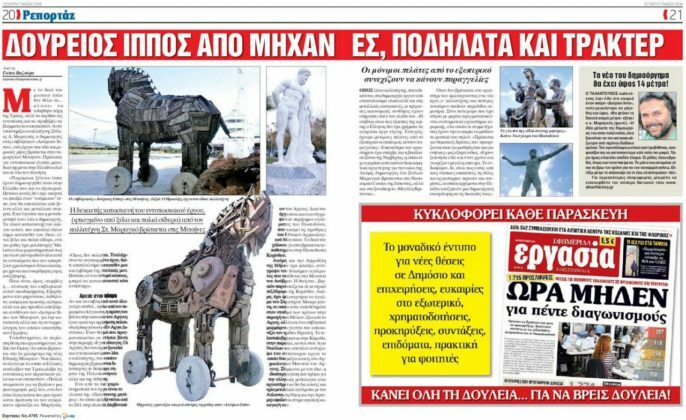 Television viewing comes shortly after the Espresso newspaper specials and rwssikoy magazine “Greece-Russia”. Thank you from the heart “Greece Insist” that did us the honour of visiting us.